Is that so? Actually, Rplace was packed last night. Sugar Beats was a ghost town! 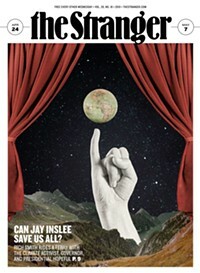 Maybe it's time to Adrian retires (or is fired) and the Stranger comes to the present moment with a fresh gay liaison. Adrian is TIRED, LAZY and LAME! C'mon The Stranger. Lose her! I hear you sister! Sounds like a real bad Stephan imitation but without the roids.